So I’ve had a 400W solar panel setup for almost a year now. I’ve been powering an inverter, DSL router, and some 12V LED strip lights. But now that I want to expand the system, I have to justify it by measuring its current performance and determining which parts of the system need to be expanded. Panels? Batteries? Wire gauge? Controllers? Everything? 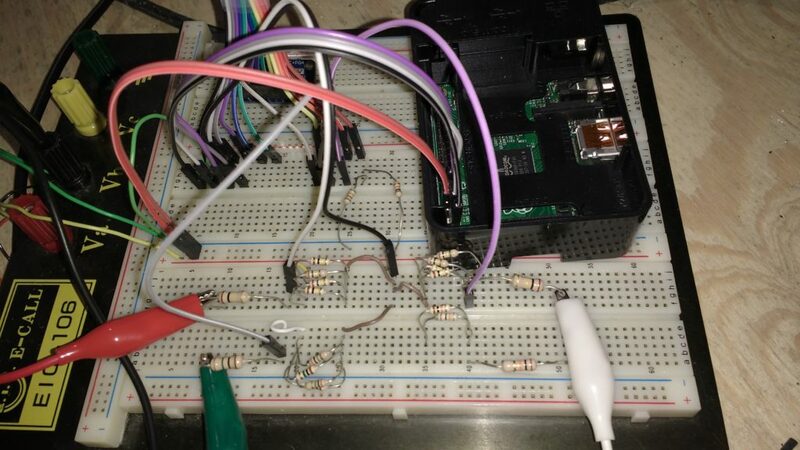 So I wired up the ADS1115 off of the I2C pins on the Raspberry PI I/O header. I’m using the 3.3v provided by the Raspberry PI and powering the Raspberry PI with the USB 5V output from the VicTec controller. Very handy. The Adafruit site has a great guide on doing this. The solar charge controller charges the battery at up to 14.1v, and the ADS1115 can only handle up to 3.3v. So I have to divide the voltage down by about 1/5 before I can put the voltage on the input to the A/D. After consulting an online resistor voltage divider calculator, and shooting for low current (but not too low to be overly sensitive to noise), I found that I don’t have 25k and 100k resistors. But I DO have a bunch of resistors in the 100k-ohm range that all have the same value. If I put four of those in parallel and one in series, I get the appropriate 4:1 resistance ratio to get 1/5th of the voltage across the solo series resistor. So I did. Sorry, enough geeking out. Yay! Data! Now I hate copying and pasting from SSH, and I need a long-term data presentation system, so I decided to pump this data into a text file and serve it up on the raspberry PI webserver. Very easy actually. Yay Python! With the above code in an infinite loop and a 10 second delay (time.sleep(10)), we’re in business. Of course, raw data is unreadable, so I’d rather plot it in a pretty chart. Quick internet search reveals http://matplotlib.org/, a great, quick, easy, simple, powerful plotting library for Python. 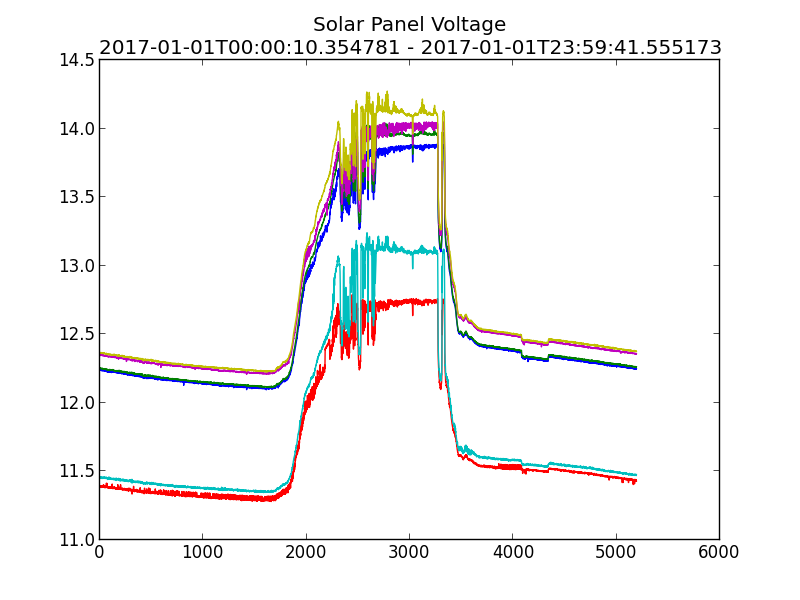 So I wrote a quick Python program that reads in my solar data log, converts the data into floats, stuffs the data into arrays, and plots the resulting lines. I left the house and the data collection alone to spend the New Year’s with my family and another family up in Iowa City. We sang kareoke in the basement and I drank way too much Fireball. Spent the next day sick as a dog. And Ta Da! 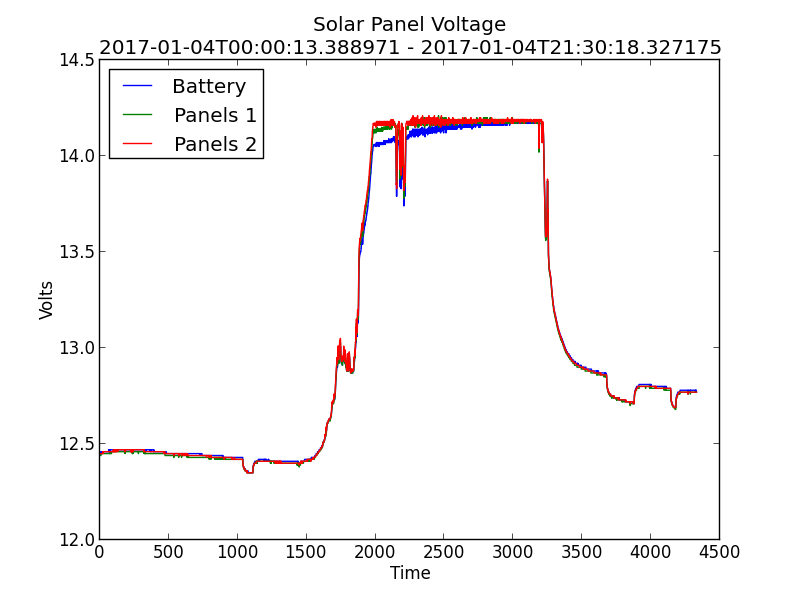 I have a solar voltage graph! Now my data starts to make sense! Keep checking back for my next posts, in which, if I actually get around to writing them, will show my solar panel setup in detail (pictures!) and start to explore what exactly is going on in this data! This entry was posted in Renewable Energy by admin. Bookmark the permalink.